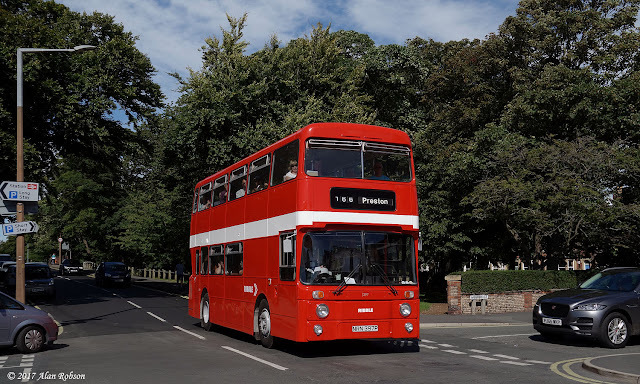 The fourth Ribble Vehicle Preservation Trust annual running day and display at Lytham Hall was held on Monday 28th August. 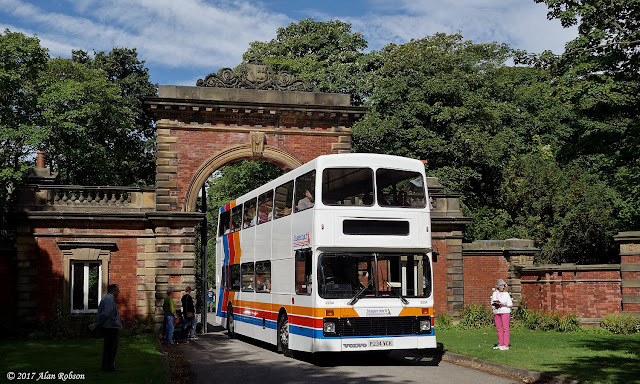 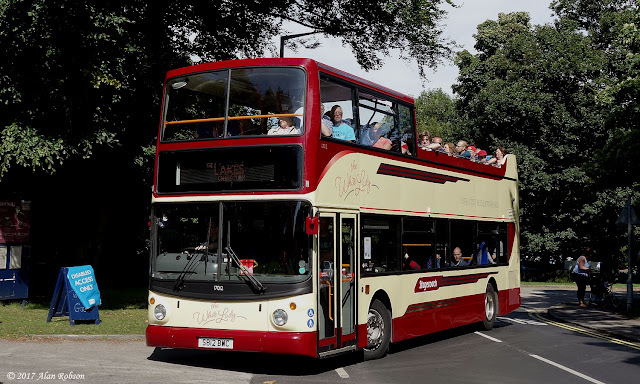 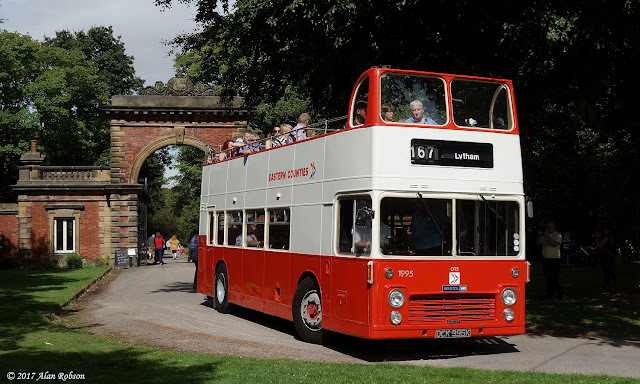 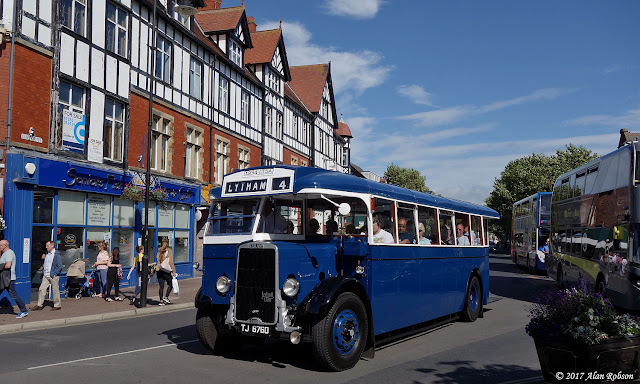 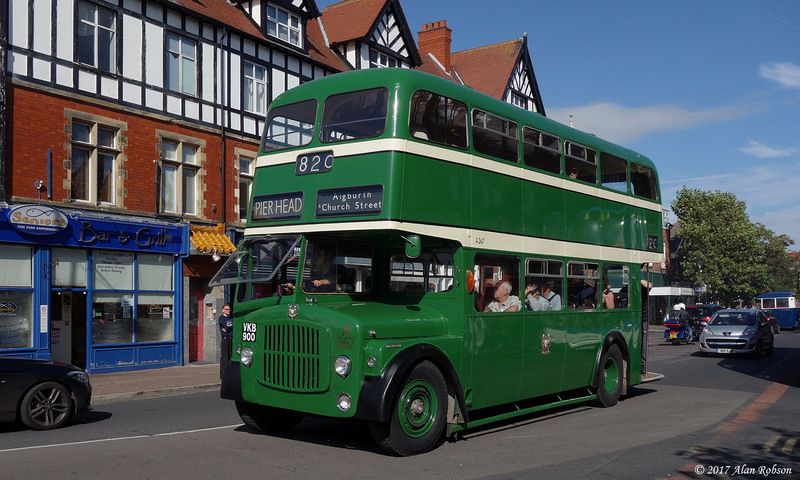 The event enables enthusiasts to photograph and ride a selection of preserved buses from various local operators, and a regular free bus service was operated from Lytham Hall around Lytham St Annes. In addition to buses from the Ribble Vehicle Preservation Trust's own collection, there were preserved vehicles from other local operators such as Lytham St Annes Corporation, Blackpool Corporation, Liverpool Corporation and Fishwick's of Leyland amongst others. 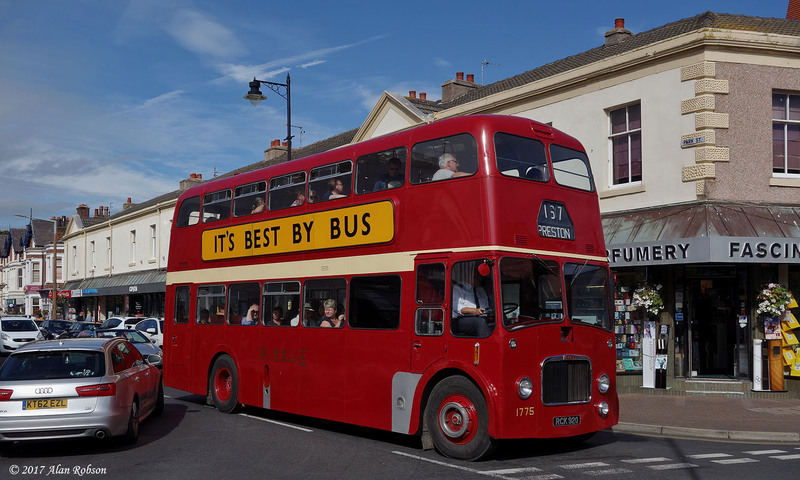 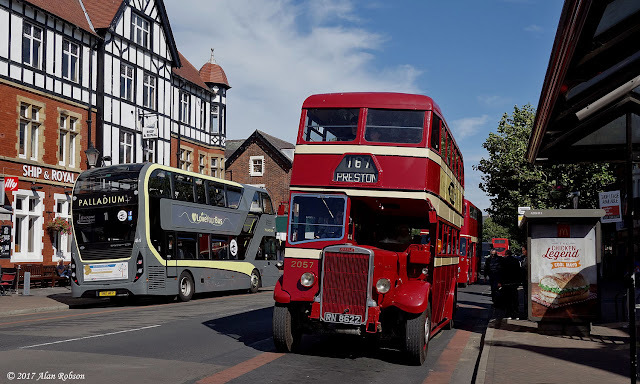 Many of the buses on display around the hall were used during the running day, providing a colourful sight for the locals enjoying a quiet sunny afternoon in Lytham town centre. 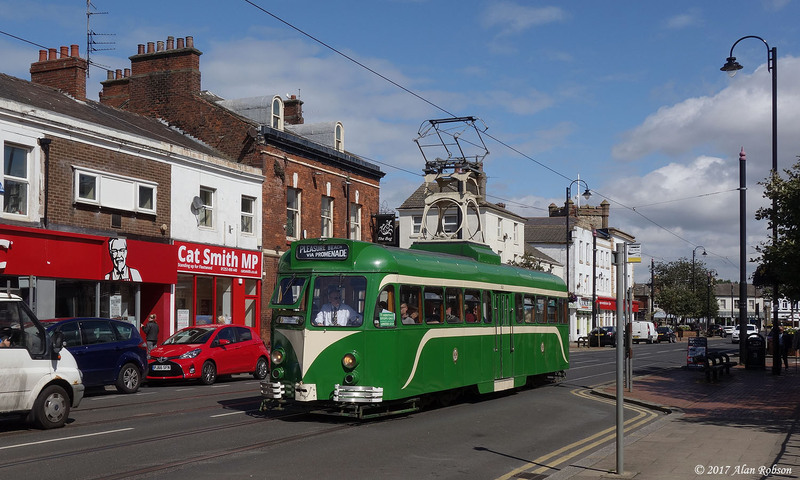 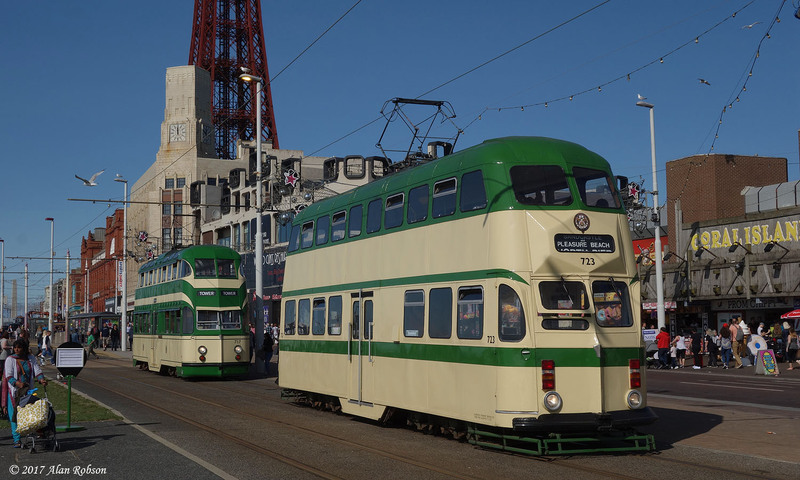 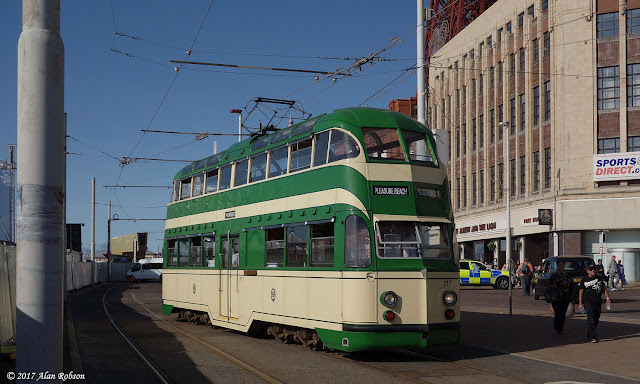 The timetabled Heritage Tram Tour output on Bank Holiday Sunday was provided by Bolton 66, Brush 623, Centenary 648, Railcoach 680 and Balloons 715 & 718, with Boat 600 assigned to specials. 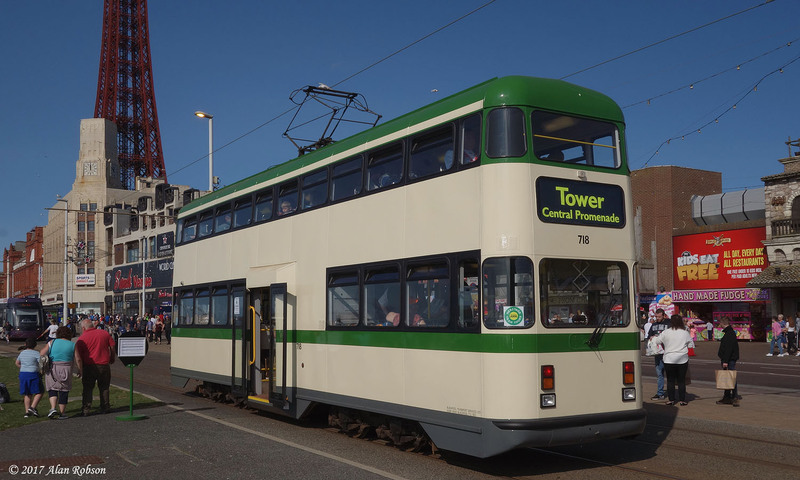 The tram service was disrupted again in the afternoon due to the Livewire Festival that was taking place on the Tower Headland, and from 3.00pm the Heritage Tour service was restricted to running between the Tower and Starr Gate. 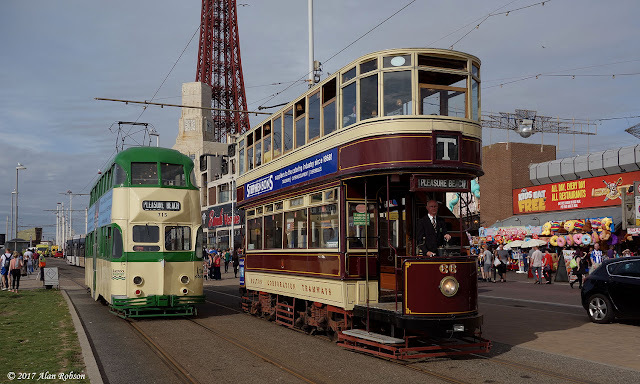 The Flexity service was again split into two, with the northerly section operating between North Pier and Fleetwood Ferry, and the southern section working between the Tower and Starr Gate. The first day of the 2017 August Bank Holiday heritage weekend in Blackpool started off bright and sunny. The timetabled heritage tram output on the Saturday was provided by Box 40, Railcoach 680 and Balloons 713, 717, 718 & 723, with illuminated Frigate 736 operating on specials. 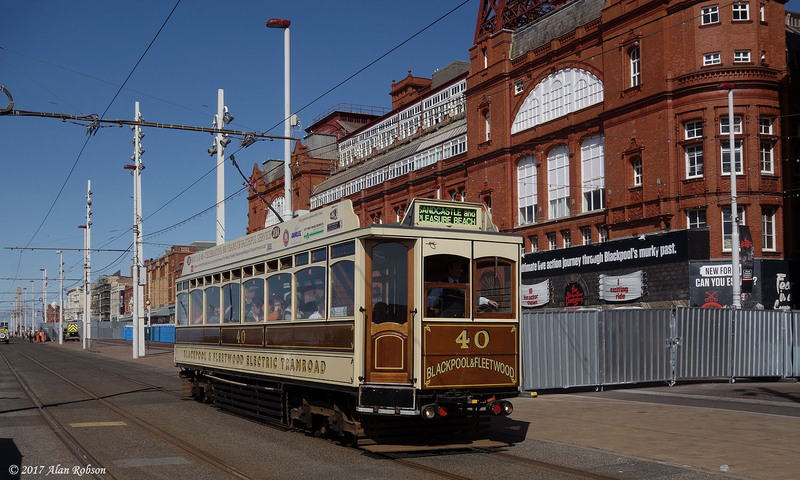 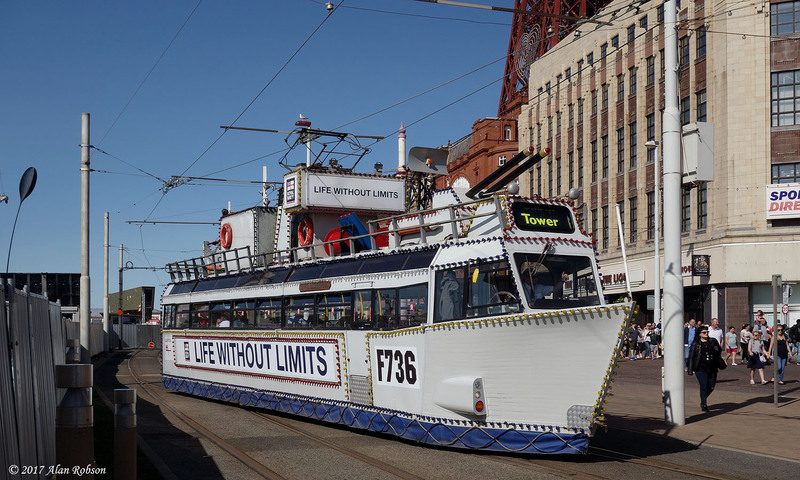 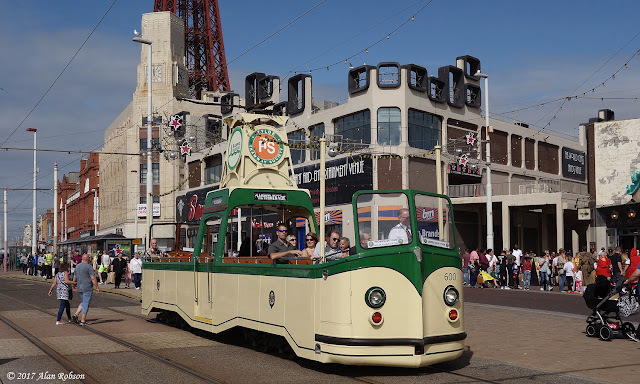 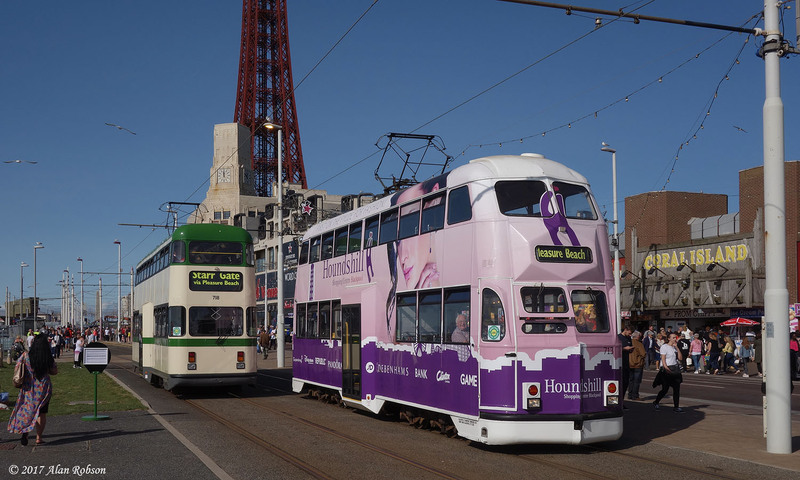 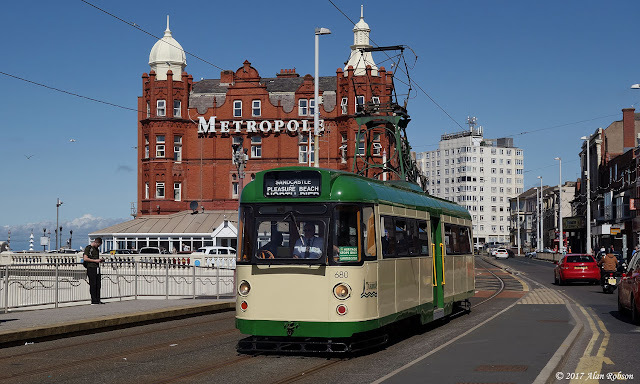 Due to the Livewire Festival that was taking place on the Tower Headland over the weekend, tram sevices were disrupted after 3.00pm, with the Heritage Tram Tour service being restricted to running between the Tower and Starr Gate. 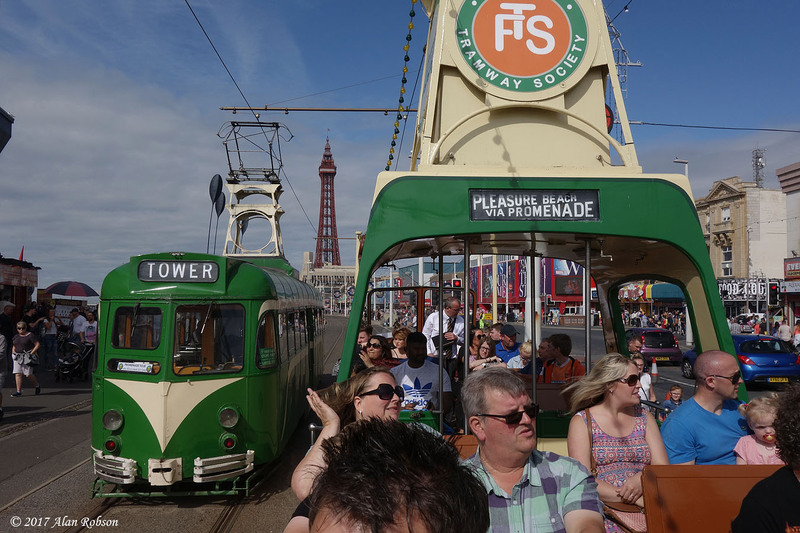 The Flexity service was split into two, with the northerly section operating between North Pier and Fleetwood Ferry, and the southern section working between the Tower and Starr Gate. 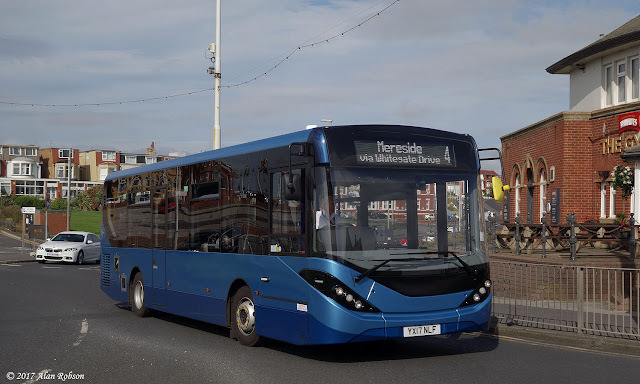 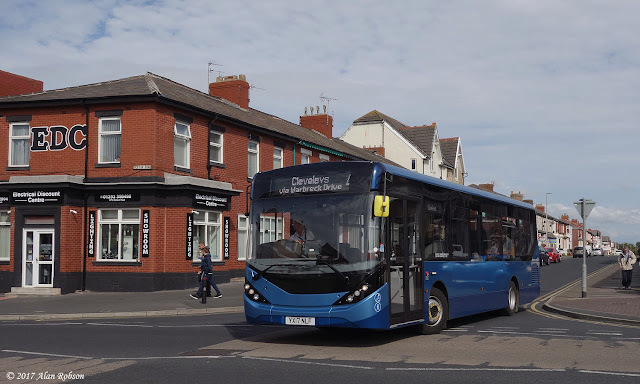 Blackpool Transport currently have an Alexander Dennis Enviro 200 MMC demonstrator on loan. YX17 NLF has been noted in passenger service on routes 3 & 4, running between Cleveleys and Mereside. 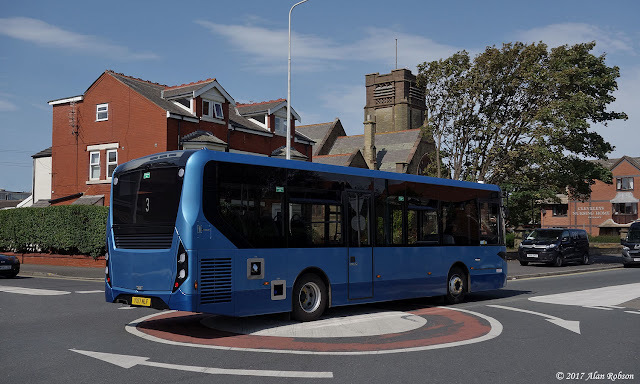 The MMC variant is the third generation Enviro 200 to be produced by ADL. Wirral Tramway based 1900 Milnes built Birkenhead open-top tram No. 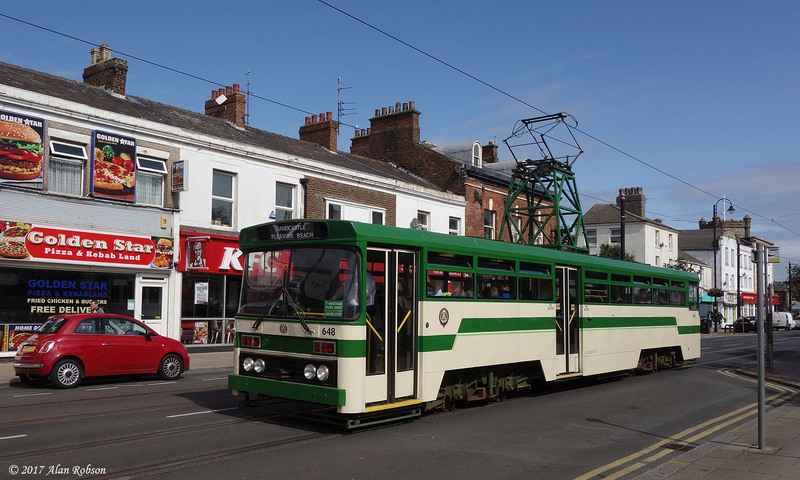 20 was spotted on test on the tramway this morning, at Gynn Square. 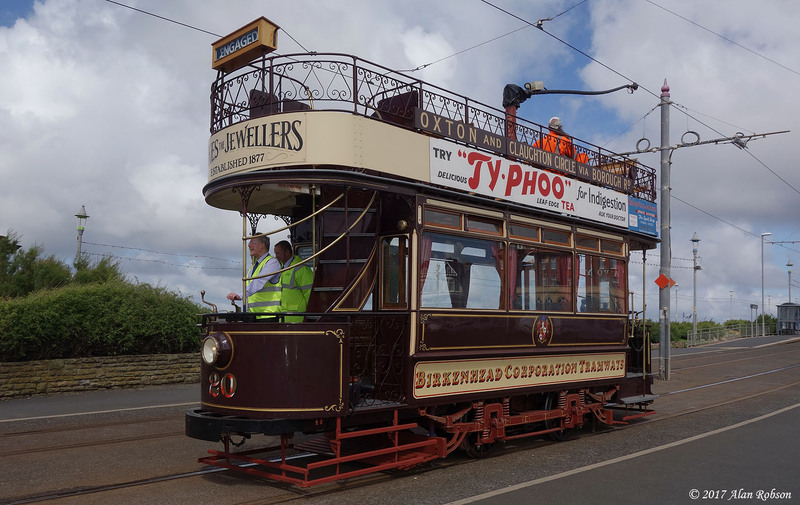 At the controls of Birkenhead 20 was none other than the Head of Heritage, Bryan Lindop. 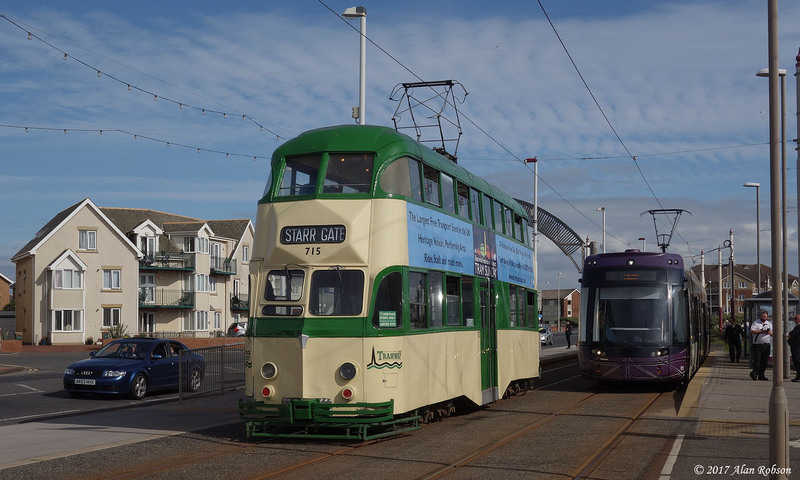 This was a proving run for the tram in preparation for it entering Heritage Tour service. 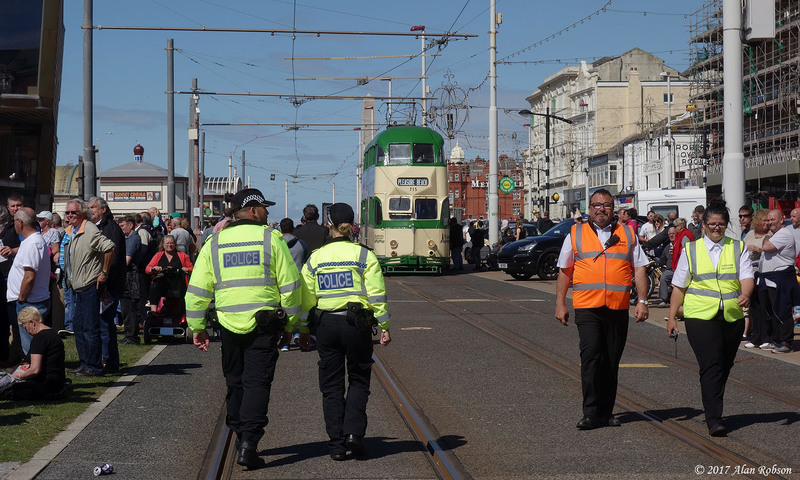 The free annual Blackpool Air Show was held over the weekend of the 12th and 13th of August along the seafront. 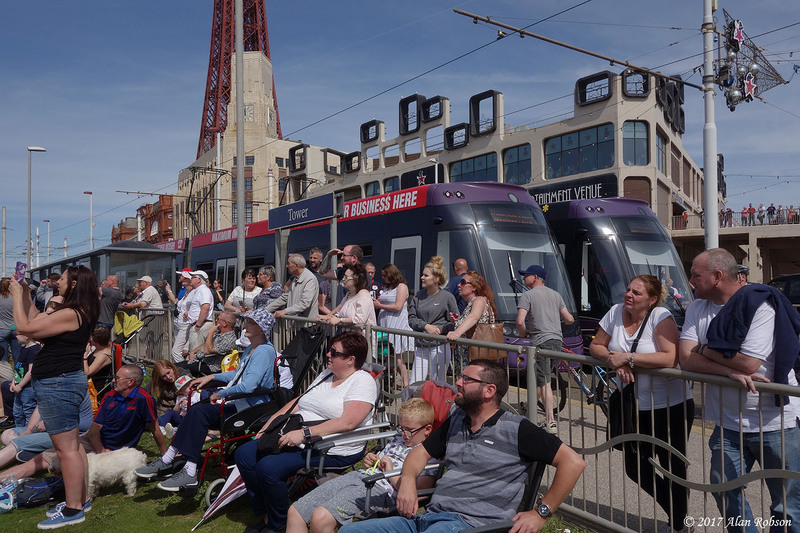 The air show attracted very large crowds, and the Flexities did a marvelous job of bringing visitors to the show from all along the Fylde Coast. 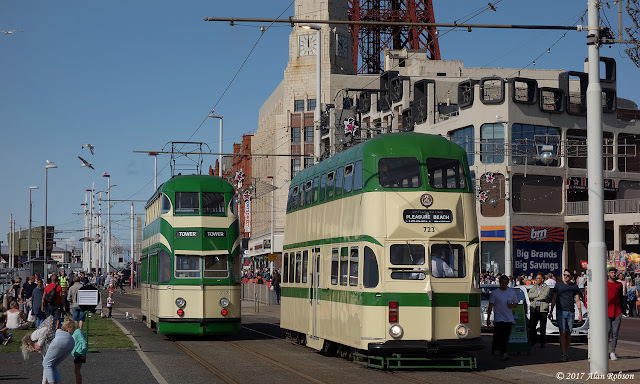 The tram service was so popular that many intending passengers had to stand and watch as fully loaded trams passed them by. The airshow display area was centred between North Pier and Central Pier, and this part of the Promenade saw the largest concentration of people watching the flying display. 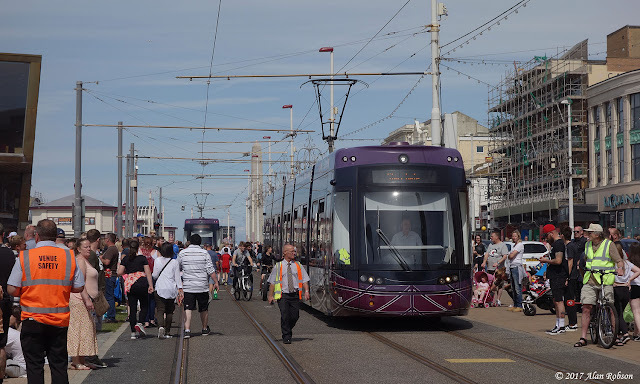 With the air show drawing very large numbers of visitors into the resort, it was inevitable that many of them would be unfamiliar with the concept of a tram service. 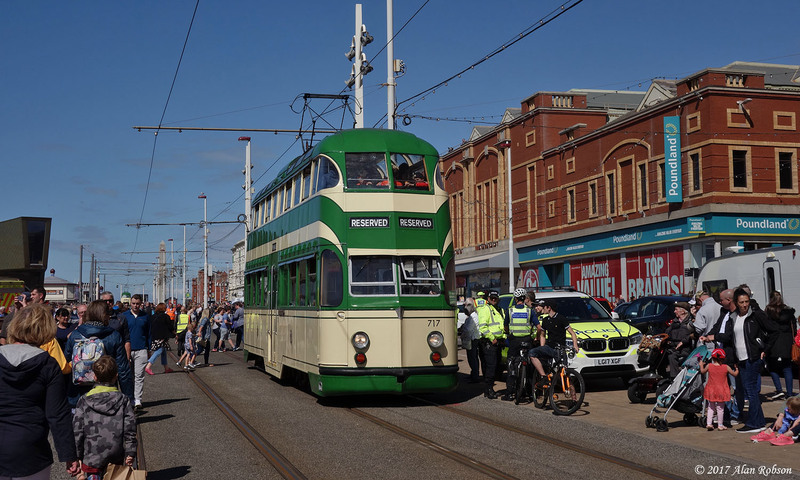 During the show the tram tracks were continually being used as a pedestrian pavement and cycling route by both children and adults. 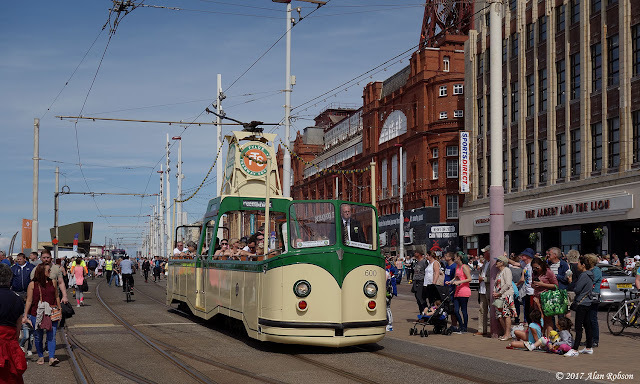 Because of the density of the crowds, and people constantly spilling over on to the tram tracks, many trams were being escorted through the busiest areas of the Promenade by a guide walking along in front of the tram. One Flexity was even observed with a youth on a bicycle leaning on the side of the moving tram. It's amazing that there were no serious accidents, but fortunately these seem to have been avoided due to the care of the tram crews and their walking guides, with the assistance of security staff employed to help keep the crowds at bay. 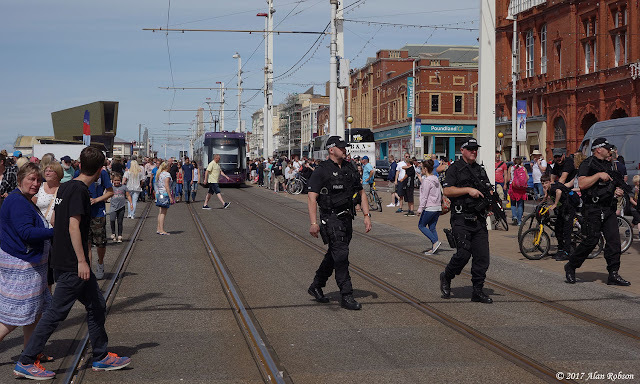 The presence of heavily armed policemen equipped with assault rifles and pistols was a slightly disconcerting sight to some people along the Promenade, but they were there for a very good reason, to dissuade any would be terrorists from committing atrocities. 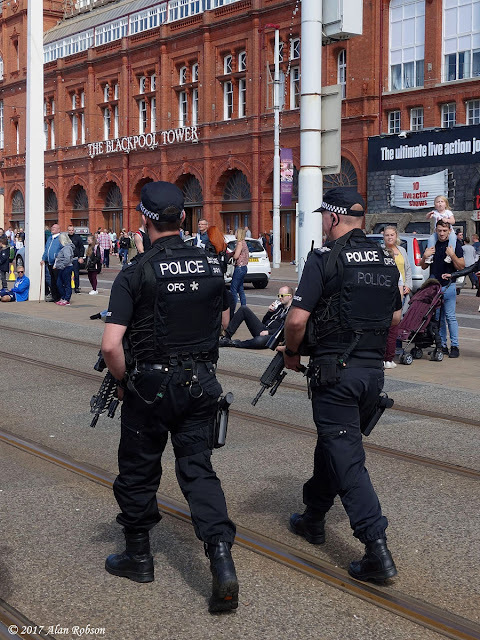 One only has to remember what happened on the promenade at Nice in France not so very long ago to understand why it was felt necessary to deploy armed police at this very well attended (and quite vulnerable) public event.